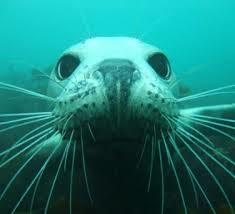 Diving with Seals at Lundy! 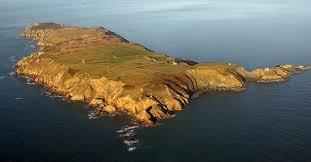 In its exposed location, Lundy is very much a fair weather destination, although there is usually some shelter to dive in on the eastern side of the island. We used the Dive Boat Obsession from Ilfracombe and the Skipper Andrew Bengey came highly recommended – the boat even had a lift! Lundy was a fair old steam out from Ilfracombe (North Devon) but was so worth it to dive with the amazing seals that are around the Island. We drove down to Ilfracombe on the Wednesday ready for a days diving on the Thursday! Dive 1 was the wrecks of the ‘Robert’ and the ‘Iona’. The most satisfying wreck dive off Lundy Island is the Robert, a small coaster lying on its starboard side at a maximum depth of 27m. Almost completely intact, the wreck went down in the 1970s while carrying a cargo of coal, and today its rusting structure is covered with plumose anemones and soft corals. Scan the interior with a good torch and you should be able to find a few conger eels, while the exterior provides a suitably craggy habitat for tompot blennies and crabs. The two wrecks lie very close together. The Iona is a protected wreck and is about 50m west of the Robert and as it is a protected wreck, a licence was needed to dive it. Andrew, our skipper, had that licence so we bimbled over and had a look as part of our dive!! Dive 2 was a scenic bimble with lots of smaller critters to see. 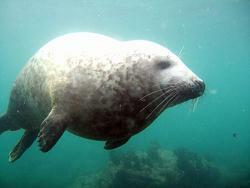 On the Friday, Dive 1 was at Seals Rock (max 18m) where the seals did not disappoint! This was followed by a shallow second dive (just by the main seal area – max 5m). 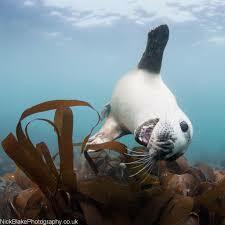 Seals here are very playful and helped to make these dives very special indeed!